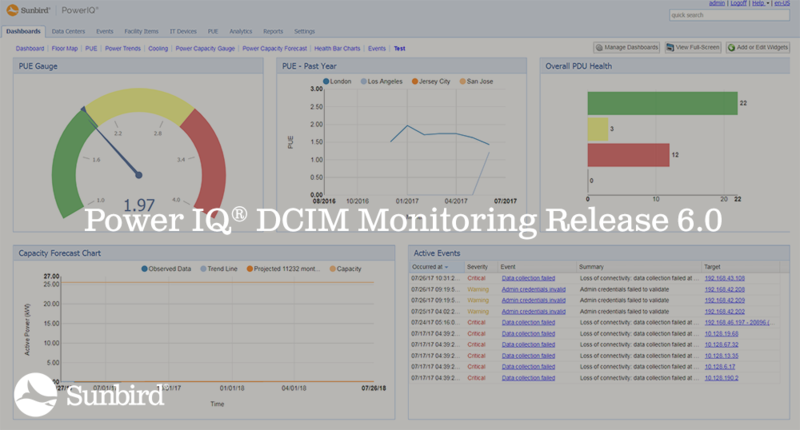 We’re thrilled to announce the release of Power IQ® 6.0, Sunbird’s Data Center Infrastructure Management (DCIM) Monitoring software. If you’re ready to upgrade to Release 6.0, simply download the update files from Sunbird’s support portal. If you’d like more information, check out our release notes or continue below. Power IQ 6.0 continues to further Sunbird’s mission of developing easy, modern, and complete data center management software. This version features several features and enhancements designed to help data center managers and operators better analyze data, save time, and reduce human error in their daily tasks. The dashboards have been updated and refreshed in Power IQ 6.0 for an elegant, modern design that implements the same HTML5 charting library as dcTrack. The new charts enable you to interact with your data in ways that unlock deeper insights. For example, the new line chart displays a color-coded legend as you mouse over from left to right, easily showing you all the readings for a specific time. Single-click actions give you a more granular look at the data by isolating specific data sets. Power IQ 6.0 and above support electronic access control via RFID cards and card readers for an additional layer of physical data center security administered via the software. Card readers are added to Power IQ via discovery. Once in the system, card readers can be associated with doors. Door security audit reports and the system audit log also show card activity, including whether access requests were successful. This release supports Baltech card readers for Raritan devices. Power IQ 6.0 makes it faster and easier than ever to perform common tasks, such as PDU rescanning, decommissioning, and maintenance. Maintenance has been added as a Health status. Additional options for rescanning, maintenance mode, and decommissioning also have been added to make it easier for you to update your facility items’ statuses and always have the most recent data. Facility items in Maintenance mode also display in the health charts on the dashboard. Users can clone facility item configuration files in Power IQ to easily roll back or restore configurations in bulk in case of PDU failures or incorrect configuration updates. When enabled, backups are made automatically as part of the scheduled database backup. The most recent backup, as well as the backups from the first days of the current and previous months, will be retained, for a total of three backup files that cover the most common use cases. In Power IQ 6.0, users can change the administrator password (used by Power IQ to poll facility items) on Raritan facility items in bulk. This feature helps customers who need to regularly change the passwords on multiple facility items. In cases where this is done for compliance purposes, users can generate a report that can be shared with their compliance organization to show that they are meeting requirements. In Power IQ 6.0, you can now receive event notifications via JSON over HTTP or HTTPS through an endpoint that you choose and configure. This enhancement helps users eliminate an email server as a bottleneck for notifications so they can get up-to-the-minute alerts about what’s going on in their data centers. Power IQ 6.0 allows users to natively manage the full line of APC® UPS products, no additional user configuration required. This release further extends Power IQ’s out-of-the-box support for a wide range of APC facility items, including rack PDUs, transfer switches, and APC Netbotz devices. Other enhancements in Power IQ 6.0 include the ability to change the administrator user name, more granular role-based permissions, server performance monitoring with performance metrics exposed to third-party monitoring systems, and a new time mismatch event to ensure that your Raritan facility items always show accurate time stamps. Additionally, customer-reported items and bugs have also been addressed in this release. For more information on these enhancements and improvements, see the release notes. To download the Power IQ 6.0 upgrade, you will need to have a valid maintenance contract and user login. To create an account, visit the support portal. Your email address and associated company information will be validated. Once you sign up, you will have complete access to our self-service portal, where you can gain access to expert tips and tricks and track the status of your support issues. Ready to upgrade? Download the update files on the Sunbird support portal. Want to see for yourself what’s new? Schedule a demo with one of our DCIM experts.